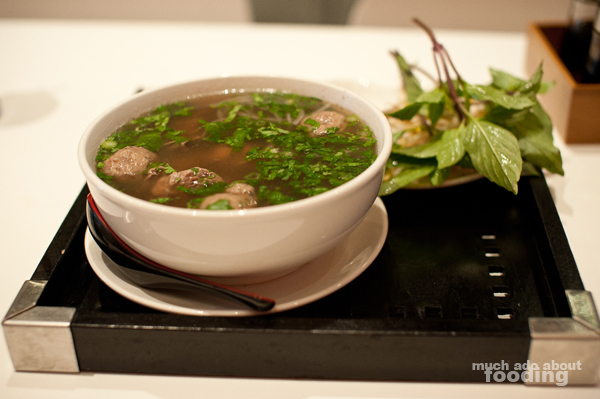 Who the heck decided that a phở restaurant should be chic and modern? It's all about the dirty, dingy hole-in-the-wall places that take cash only when you want good phở. 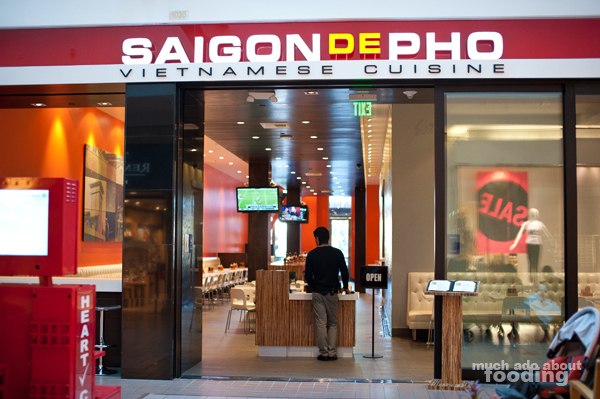 So imagine my surprise when I was in Main Place Mall one day and saw a sleek red, white, and black phở restaurant inside (they caught me with their good design and color scheme!). I didn't go in that time but made note to return later for some scrutiny. It looks nice inside. It really does. I'm not saying that should really be taken into consideration when judging a restaurant for its food but mentality has a lot to do with how you consume your food as well. It's a mind game! You amp up the atmosphere and maybe you'll trick your tastebuds into thinking you're about to eat the best thing ever. Anyhow, the menu had fairly standard Vietnamese fare but not in Vietnamese! In fact, Duc didn't even know exactly which phở dish was the one he always gets so he just asked the waiter if he spoke Vietnamese (yes) and ordered in that, hah. 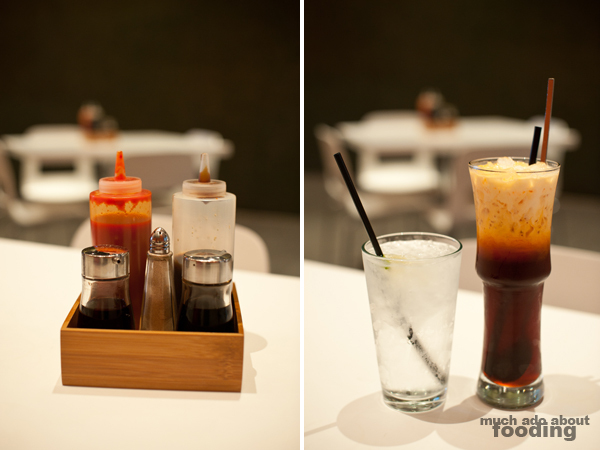 To start off, we got their Thai iced tea which came in a long necked glass. It was decent. The condiments were at the center of every table in unmarked containers. I think they might assume too much about their customers. 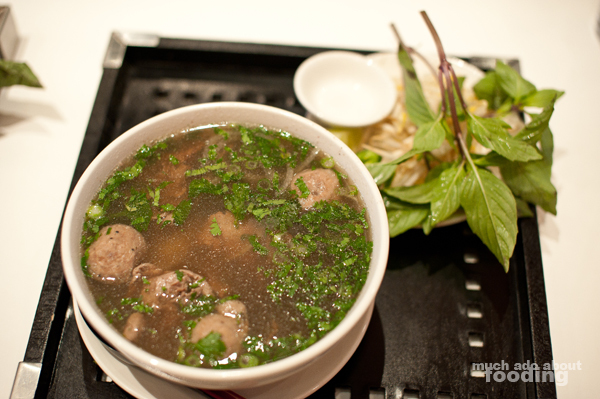 What if some have never had phở before? Oh well. They brought out the phở on these black square trays with individual plates for bean sprouts, lime, jalapeno, and basil. I was surprised to see that the basil wasn't as fresh as dingy phở places have. Admittedly, despite the chic look and suspicion I had of a place that wasn't sketchy and made me fear for my life, the phở was fairly good. It was definitely priced higher than what I know better phở goes for but it's in a mall for goodness' sake ($8 a bowl). It's a quick fix for a craving. The broth wasn't as clean as it could have been (still greasy and with floating remnants of cooked meat) but it was definitely a good savoriness. The flavor profile was all there. Duc had gotten the rare filet mignon with meatballs ($1 more for meatballs...geez) while I got the rare filet mignon with well-done flank and tripe though I think my flank was missing. There was a lot of meat, thin and pliant in our mouths. 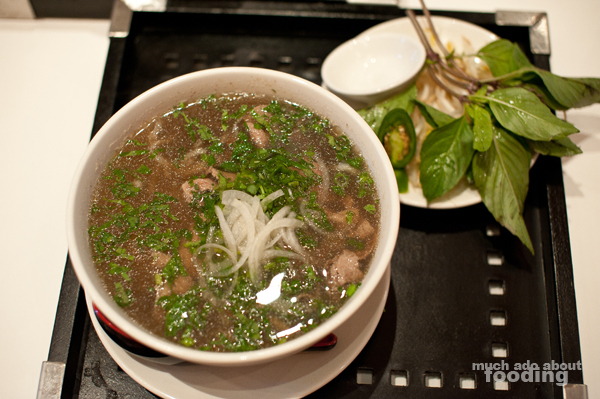 The heat didn't stay long in the bowl (a good bowl of phở must be steaming throughout the meal!) and the noodles clumped together a bit at first but overall, a good bowl of phở if you're feeling a need to eat while shopping and can't take a drive down to Garden Grove or Westminster for cheaper and arguably better.